The Abu Dhabi National Oil Company (Adnoc) observed International Youth Day across its headquarters and all operating companies yesterday (August 12). During the celebrations, which were organized by the Group’s various youth committees, Adnoc’s young talent focused on the contributions they have made to the business to enable enhanced performance, profitability and efficiency, as well as their aspirations for the company and the UAE. 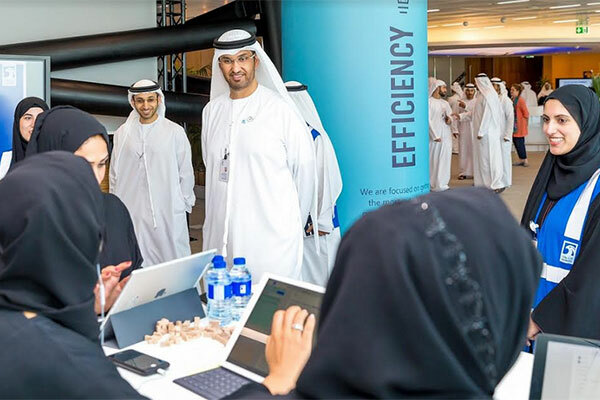 Adnoc’s younger employees also participated in a series of engagement events with the company’s senior management, including Dr Sultan Al Jaber, UAE Minister of State and Adnoc Group CEO. “Our youth are the bedrock of Adnoc’s future. They play a pivotal role in unlocking our full potential and delivering on our 2030 smart growth strategy. We invest in our young people and enable them to think differently so we can seize the material growth and value creation opportunities across the company’s operations,” said H.E. Dr. Al Jabber. “Given the importance of our young talent, we have established a focused approach to attracting and retaining the best and brightest minds and ensuring that we provide them with the space and opportunities to develop their full capabilities. Adnoc has a long history of investing in UAE youth and nurtures an exceptional talent pool that our company and our nation taps into,” stressed Dr Al Jaber, when he met with participants at the various events.